Gong notes are beautiful and strong vibrations, a gong bath repeatedly stacked over top one another. Like water droplets hitting the surface of your skin, as if washing your body under a waterfall of the sound of gong. Gong is the only musical instrument that can tap into the inner depths of the divine creation of space vibrations. The sound of gong is the sound of the soul. When we strike the gong, it is like striking the percussion of the universe, into the vast galaxy whirlpool, washing both body and mind. Sonic sound makes us calm, relaxed, and also closer to the inner self. This time gong bath, the international Gong Master Gongmuse Surana will play a lot of plant gongs such as sun, five planets of the solar system, earth and moon…etc. Bring us travel in the sound sea of universe. Surana is an internationally recognized teacher of Healing Sound of Gongs, Himalayan and Crystal singing bowls and Voice. 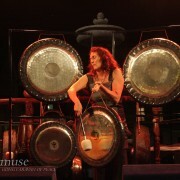 She has been traveling and teaching Gong Master Trainings since 2003, in many countries of Europe, as well in Dubai, New Zealand, Australia, Usa, China, Hong Kong. A lot of her travels she did together with Gong Master – Don Conreaux, as his assistant and as co-teacher on 30 and more one-week Gong Master Trainings around the World. She is originator of “Meridian Sound Massage” with Himalayan singing bowls, which she has spread to many hundreds of families, as well to many therapists and wellness centers.As artist, she has performed around the world and her CD’s are regarded for effects of nurturing the listeners. Before diving into the Healing Sound, she was working and teaching in the fields of Reflexology, Colour Therapy, Dance Therapy, Laughter Yoga, Trance Dance and Awakening of the Feminine. ※Gong Bath Fee: 一般價General NT$1300, 早鳥價Early bird NT$1000 （before March 30th), Please come early 15 mins before event staring. The Dulan Strip’s first spoken word event. EVERY FIRST WEDNESDAY OF EACH MONTH. These evenings start at 7pm. The first reader/speaker will be introduced and called up on stage after a few words from the host (me) at around 7:30. There will be an intermission, after which the 2nd half begins 15 to 20 minutes later until the last speaker/performer. Usually finishing between 10 and 11pm depending on how many guests there are wanting to speak. Invite friends. People that would like to get up on stage and read some poetry, sing a song, make a statement or just tell a good joke. Anything goes. There is a sign up sheet for those who want to share something. Or just come along to see what happens and enjoy being part of the “Culture of Listening”. Buy a bottle of wine at the entrance to share between 2 or 3 of you. That’s the entrance fee. There’s plenty of entertainment and carefully prepared delicacies to enjoy throughout the evening. These events are also a “Community Grapevine” and can be treated as a “Forum”. A gathering place for us to meet, drink wine and get things talked about. If we have something to say then we should say it. 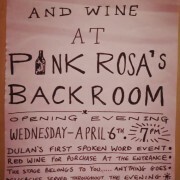 at Pink Rosa’s Back Room is waiting for you”. WEDNESDAY APRIL 6TH IS OUR OPENING EVENT.